The new guitars boasts high-quality construction at affordable prices. 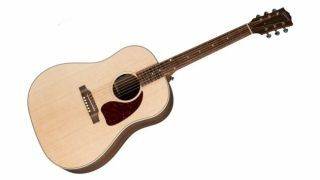 NAMM 2019: In addition to Gibson’s recently unveiled Classics and Contemporary electric guitars, the company has introduced a new series of acoustics, dubbed the Generation line. Aimed at younger and entry-level players, the affordable line boasts high-quality, USA-made guitars “built by the same hands that make the J-200 and J-45’s,” according to Gibson. The first guitars to be unveiled at the G-45 Studio and G-45 Standard, priced at $999 and $1,299 respectively. Both guitars feature solid Sitka spruce tops and walnut back and sides and exquisite finishes.